Romeo the water frog, a social media star whose desperate need to mate has not been met, is now staring down extinction as stoically as an amphibian can. 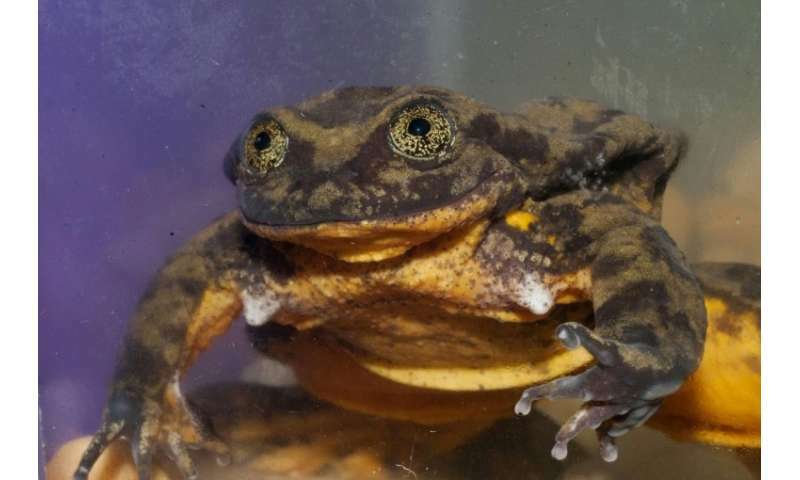 Romeo is the last known frog of his kind—a Sehuencas water frog, or Telmatobius yuracare. And he has been fruitlessly calling for a mate from his tank at the Cochabamba Natural History Museum for years on end. Unable to hook him up with a local, his minders in February launched a global call for help finding a Juliet for the little guy with a purposeful, gold-specked stare. About $25,000 was raised to help with the campaign—but so far, months have come and gone without so much as a solid lead. So his lonely croak goes unanswered. The frogs live about 15 years and Romeo was found nine years ago. Nobody immediately suspected finding him a mate would be such an uphill battle. "So now we are at the emergency point where we have to find more of his species, or it will go extinct," warned Teresa Camacho Badani at the Natural History Museum of Cochabamba. The frog is found in two parts of Bolivia—Cochabamba and Santa Cruz. "This is an endangered species, stays in water and most common in Bolivia. ...(known to live at) between 2050 and 3600 meters above sea level," Camacho told AFP. Sampling scientists did back in 2006 and 2008 illustrated the species was faced with an alarmingly fast-paced path to extinction. It used to live in Ecuador, Camacho said, but is believed to have died out, its croak already silent in that fellow Andean nation.